Too many times I see novice gardeners just start buying random plants online, or from their local nursery, and they put them in the ground wherever they feel that one plant looks best. This by itself isn't necessarily a problem, we've all been there and done that. However when you put together a garden randomly like this, you often overlook some very important traits of the plants you are putting together. For instance, do all of the plants perform equally as well in the type of sun light this section of your garden gets? Will they all thrive in the same soil type you have in your garden? When the plants reach full maturity, will they all still fit into the space provided to them? When planning a rose garden, these are important questions that need to be asked, along with many more. It is to your own benefit that you should take a few minutes, or days if need be, to lay out your rose garden before you go digging holes. This is an essential step in planning a rose garden because you have to make sure that all of the plants you choose for a particular space will grow well together. Now by and large most roses require the same basic care, and the same overall soil that drains well, but the sizes and traits of roses vary greatly from one variety to another. For instance, if you know the spot you have picked out tends to get a lot of water and doesn't drain as well as it could, you will not only need to amend the soil a bit to make it more agreeable, but you should also choose types of roses that are resistant to blackspot and/or mildew. You will need to know the location's exposure to sun light during good weather days as well. 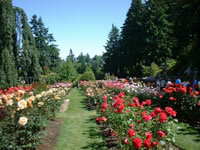 As a general rule of thumb roses require a minimum of 6 hours a day of full, direct sun light. If you can give them 8 hours or more, that is even more preferably. If your choice of locations meets this criteria great! But if it does not, and you insist on planting a rose garden there, then you should start looking for types of roses that are tolerate of shady locations. There are in fact a number to choose from. Be careful what types of roses you mix together in a single planting area as well. When planning a garden, you need to make sure that one or more roses will not outgrow and overtake the others in a few seasons when they get big and full. You would regret for instance planting a large vigorous climbing rose next to a miniature rose. Take the time to research each particular rose and find out how big they will get before selecting them for your garden. The type of soil you choose to grow your roses in is just as important as your choice of roses themselves. Roses need soil that drains well, but it should have some ability to retain moisture. Otherwise the nutrients will simply drain away after each watering before the plant can absorb them. Conversely, soil that is too rich in clays will actually smother the roots of the plant, also preventing them access to the nutrients. You need to find a healthy balance somewhere in the middle. Whenever I get into a discussion with new gardeners who are planning a rose garden, I always suggest to them that they take a trip to their local garden center and pick up a bag of a good organic compost (if they don't make their own already). I got turned onto this tip years ago and I quickly realized how much of a difference this stuff really makes when establishing new plants, and roses especially love it. When you dig your hole for planting, mix in the compost with the soil at a ratio of 1 part compost for every 2 parts soil. You won't regret it! By now you have a site picked out, have probably selected your roses, and you are ready to get them into the ground. Making sure that you plant them correctly is very important when planning a rose garden because if you do the job improperly, the roses may not be healthy and could never perform for you well. If you bought your roses from a local nursery, then they were most likely already established in a container and probably blooming. 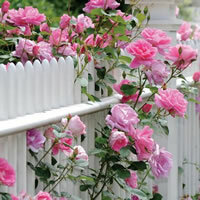 These are the easiest types of roses to plant because the guesswork is already done for you. All you have to do is dig the hole at least twice the diameter of the container, and equally as deep. This gives you ample room for your new soil mix around the root ball, but it will keep the bud union at the same depth it was planted in the container. Simply set the plant in place and back fill with your new soil mix. 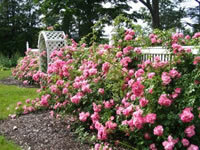 If you are planning a rose garden with bareroot plants purchased online, you have a slightly tougher task ahead of you, but it is still straight-forward to accomplish. The first thing you should do is soak your bareroot plants in a bucket of lukewarm water overnight to re-hydrate them. Then go ahead and dig yourself a hole that is as wide as the longest roots on the plant, and deep enough so you can mound up some soil in the center of the hole, and still keep the bud union an inch or two below the surface once filled. Set your plant on top of the mound and spread the roots out in all directions. Back fill the hole halfway to start and then water the loose soil heavily until it flows around the roots like mud. Go ahead and back fill the hole the rest of the way and water it once more heavily. This should ensure that no air pockets have formed around the root. Repeat these steps for each plant in your rose garden. 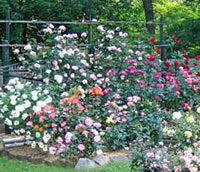 Proper planning and execution should give you a great and bountiful rose garden for years to come.